Easy Philly Cheesesteak Recipe loaded with ribeye, cheese, onions, peppers and flavor. An easy Instant Pot Recipe ready in under 25 minutes! This is for all the Philly Cheesesteak Sandwich and Instant Pot lovers out there! We love this set and forget Philly Cheesesteak Sandwich recipe. It’s quick and super easy to make and ready in under 25 minutes. It’s an Instant Pot Recipe your entire family will enjoy. 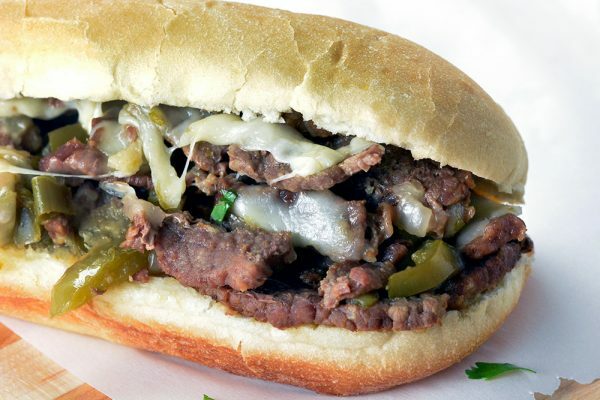 Philly Cheesesteak Sandwiches come in many shapes and sizes, although the authentic Philly Cheesesteak Sandwiches are made with rib eye, cheez wiz and a specialty roll called Amoroso rolls, not commonly found outside Philadephia. 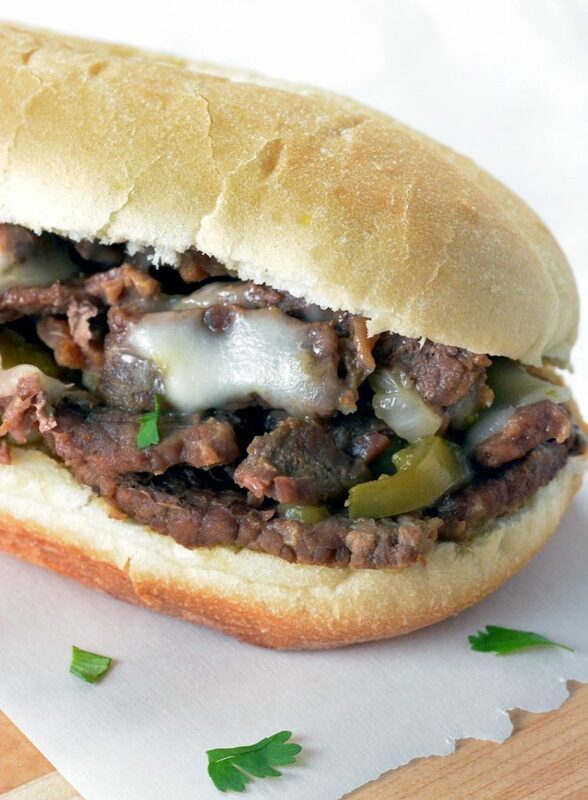 For the rest of us, there are easy substitutions that make for one killer, easy Philly Cheese Steak recipe. While we love Cheez wiz, we prefer provolone cheese on our sandwich, which is what we’ve featured in our recipe. Feel free to replace with Cheez wiz or American. We’ve seen some recipes featuring swiss cheese, but we’re not fans. Throws off the traditional flavor balance. We prefer to use the traditional rib eye, however it’s rather expensive and you can get similar results with top round. When utilizing tougher cuts of meats we like sprinkling meat tenderizer on it a few minutes prior to cooking. Freeze the steak for 30 minutes prior to slicing to make it easier to cut into thin strips. Like mushrooms in your Philly Cheesesteak? Add in a handful of them in when you’re sautéing the pepper/onion mixture. This Philly Cheese Steak Sandwich Recipe can be doubled to make four sandwiches or tripled to make six, depending on your needs. TIP – the liquid left over after cooking makes a great “aus jus” style dip….transfer it to a ramekin and dip your sando right in! READER Q&A ADDITION: – A few of you have asked about the minimal liquid in this recipe. I’ve never had an issue with it not pressurizing as there is water that escapes both the meat and vegetables. In addition we have some butter and worcestershire. For reference, since all models are different and that could make a difference, I’m using the Ultra Pot Duo. If you’re worried about it, or your model does have an issue that mine doesn’t, feel free to add a 1/2 cup of beef broth before cooking. It will just mean more Au Jus for you!! Win-win. Freeze the beef for 30 minutes (optional - easier to cut). Cut the ribeye against the grain into super thin strips and set aside. Set the Instant Pot to the Saute setting and add the butter. Cut the bell pepper and onion into 1/4" strips and add to the Instant Pot. Add the beef, onion powder, Worcestershire and stir to combine. Put the lid on the Instant Pot and set to 8 minutes on "Pressure Cooker" high setting. Let NPR for 12 minutes before removing the lid. Add 2 slices of cheese and stir to melt and combine. Using tongs, take half the mixture and transfer to the hoagie roll. Repeat with the rest of the mixture. Add salt to taste and top another slice of cheese (optional). I made this last night as my 1st Instant Pot meal… delicious and super easy to follow. Thank you! 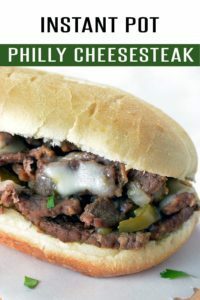 I just picked up a 3qt InstaPot and read this Philly Cheesesteak Receipe….my first menu! Thank you.